A new client here in Albuquerque, New Mexico had a saxophone he needed detailed photos of to help him sell it. He brought the sax over to my Home Studio for a pre-shoot discussion. This was very helpful from just knowing how to handle the very complex saxophone as a musical instrument itself and how to rest the sax on its stand (the ring is not obvious to put through the stand opening). Pen product photography shot St. Petersburg Florida - Nikon D300 Nikkor 105mm VR micro @ f/16 ISO 200 1/250th - Strobist: SB-800 in shoot through umbrella key light & two speedlights side lightingShared Vision (a returning client) contacted me for an interesting and challenging product photography shoot at their downtown St. Petersburg, Florida location. It was to make photographs of a DNA kit, including close up shots of the individual products which included a pen. From the shotlist they sent I knew it would require the most gear I have ever used at once to make a single photograph. As is too often the case, I totally forgot to take photos of the setups I used! 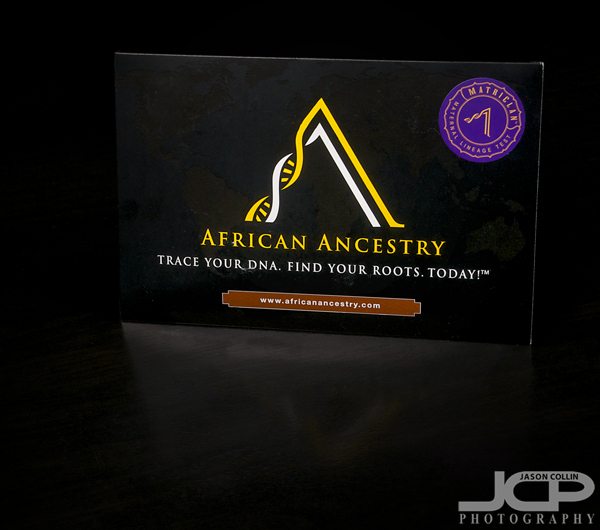 St. Petersburg commercial product photography African DNA kit - Nikon D300 Tamron 17-50mm @ f/11 ISO 200 1/200th - Strobist: SB-800 left & right in shoot through umbrellasDue to the complexity of this shoot I brought in an assistant to help out, friend and colleague Pedro, whom I have done shoots with before. Having an assistant greatly freed me up to concentrate on just making the shots, not having to also setup all the speedlights and do all the product position arrangements and adjustments. 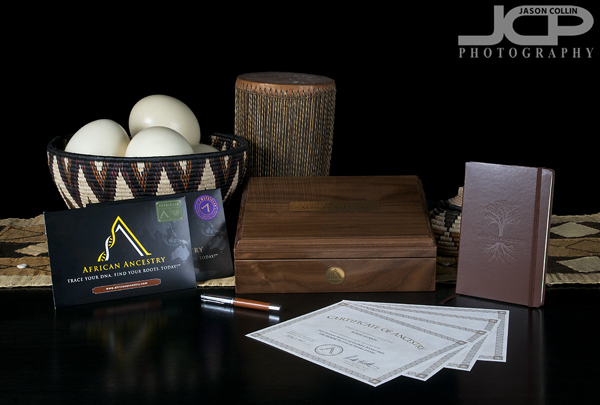 The above shot was actually the first of the afternoon, containing all the items included in the DNA kit, along with a few props (drum, basket, etc). Not surprisingly, being the first shot and the shot with the most items in it, this shot took by far the longest to get a desired final result. The background was a black sheet, but I still replaced it with a fully digital black background. Case & pen product photography in St. Petersburg Florida - Nikon D300 f/11 ISO 200 1/200th - Strobist: SB-900 in snoot to frame rightWe were working from a shotlist that included a shot of the case seemingly illuminated from within. To achieve a similar look, I used a speedlight with a 6" snoot attached to it that really concentrated the beam of light. Only a single speedlight to frame right was used to make the shot. Pen & journal macro product photography - Nikon D300 Nikkor 105mm VR micro @ f/4 ISO 200 1/250th - Strobist: 2 speedlights left & right in snoot & gridThe pen on notebook image above used yet another strobist setup, this one with two speedlights basically pointed at each other on either ends of the table the notebook was on. 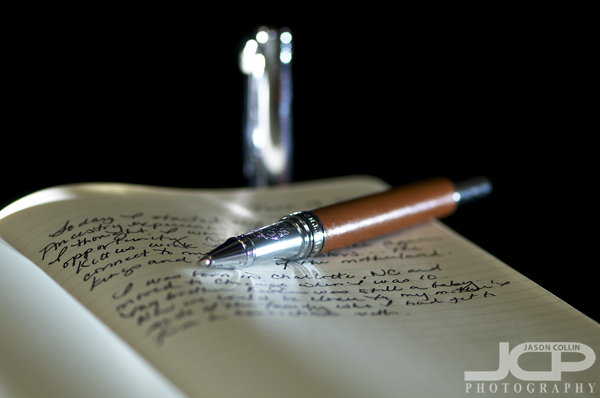 One speedlight had the same snoot on it, the other a grid to concentrate the light to show just the pen and notebook. The black background occurred naturally from that process & using a fast shutterspeed and black sheet backdrop. Commercial envelope photography on black background - Nikon D300 Tamron 17-50mm @ f/11 ISO 200 1/250th - Strobist: SB-800 in shoot through umbrella key light with speedlight to frame rightOne big challenge was how to photograph a black envelope on a black background and have it standout in some way so the edges do not look invisible. I started out having one key light in front and a speedlight directly behind the envelope, but that produced too much spill light, but looked kind of cool, like the envelope was in a starburst. Moving the speedlight to the side and turning its power way down provided enough rim light so the edges showed up. Photigy.com was very helpful in demonstrating how to photograph pens and a site I checked out before this shoot. Bayprint owner Al inspecting a special print destined for the windows of Cassis - Nikon D300 Tamron 17-50mm @ f/7.1 ISO 200 1/60th - Strobist: SB-800 at 1/1 power in 43" brolly to frame right & SB-600 @ 1/1 power in 43" shoot-through umbrella to frame leftA sudden commercial photography job came up when I saw Al at a networking event he was hosting just yesterday. 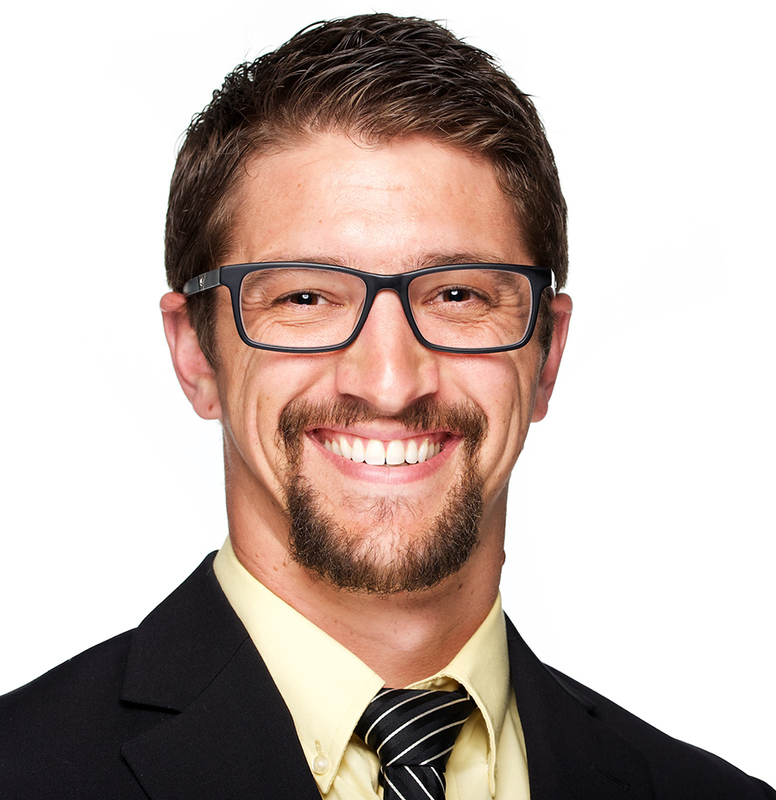 Al is a past headshot client (see here) and has also referred other business to me. The project we started today involves me photographing special window display prints he is making for the downtown St. Petersburg restaurant, Cassis. The first shot he wanted was the above, showing the prints coming right out of the (large!) printer. The remaining shots will be of the installing process as well as a before and after of the Cassis window front. As is often the case with on location commercial shooting, space is in short supply and careful placement of lighting for strobist shots is necesary. I put my 43" brolly on a light stand partially in a closet next to the printer and ultimately placed my 43" shoot-through umbrella on a light stand to camera left. I wanted to maintain good detail in the full frame of the shot, so I used a small aperture of f/7.1 causing me to have to use both speedlights at full power, something I normally do not have to do. The ambient light in the background was pretty well exposed at 1/60th, but I still did some dodging in Photoshop to make the lighting balance overall between foreground and background. The last detail was making the shot from a higher perspective. Al is a pretty tall guy, and the print was fairly long coming out of the printer, so I used a step-stool to get the framing as seen above. 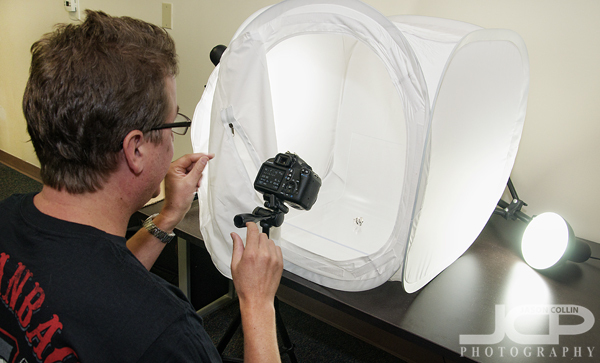 James making a macro shot of a ring in a lightbox during our 1-on-1 photography lessonThis morning I headed over to the BB&T Building in downtown St. Petersburg to meet James in his office for an atypical 1-on-1 DSLR Photography Lesson. He sells rings and other jewelry and wanted help making the best product shots he could using his Canon T3, lightbox and Canon 60mm macro lens. He also wanted workflow instruction on how to cleanly remove the ring from the background and place it on a pure white one. We started off with shooting instruction and the best settings to use and also where to place the lights to give the best look on the ring itself. 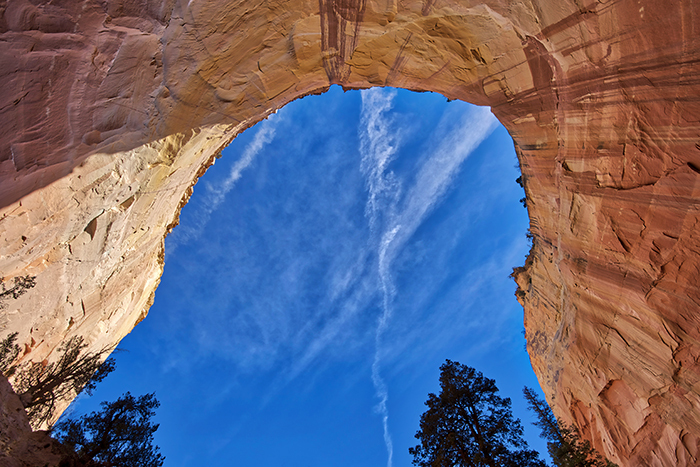 Since the lighting and subjects were constants, it did not take long to dial in the best settings. We took those sample shots we made and opened them in Photoshop where I showed James my Quick Select & Refine Edge technique for putting a subject on a clean white background. In order to produce the best looking edges, I had to use one extra setting I had not used before in the Refine Edge process, teaching myself something new on the fly as well as James! In the end we were both very pleased with the results we were able to produce. One other top tip for Photoshop, if you are having trouble selecting an image, do not crop the image at all, leave as much space between the frame and the object as possible, as this was how we were able to get a more accurate quick select. I told James many times that Photoshop is alive and has feelings and needs to be coerced sometimes into doing things! James only had a very short and flimsy tripod to put his Canon T3 on so right during the lesson I helped him pick out a very nice Induro tripod and also a cable release! It was a fun and different lesson than my usual ones and I enjoyed learning about James' various businesses. Check out James' great selection of biker jewelry! Model: Lindsay; Cushease product shot on location in Clearwater; f/11 ISO 200 1/250th with 42" reflectorA commercial product photography shoot with models for Cushease in Clearwater was my first experience shooting on a boat. As soon as I came aboard I instantly realized that doing photography on a boat will be an all new challenge, with not the least challenge being not slipping overboard strafing back and forth to the bow. I also learned that you will definitely need assistants while working on a boat. I had already confirmed that the models when not in front of the lens would be willing assistants to hold either the 42" reflector or a speedlight. On dry land you can setup a light stand to hold speedlights and reflectors, on a rocking boat, that is not possible. University of Florida Gator embroidered products by Cushease - Clearwater commercial photographyThe client was actually Karin, one of my new, dedicated DSLR Photography Lesson students. Her company, Cushease, has a large product catalogue featuring weatherproof chairs, cushions and pillows. The images from this shoot will be used to update her new website, print catalogue and in various advertising mediums. That is Karin's dog on the Gator pillow above. He was very well behaved and a willing model. 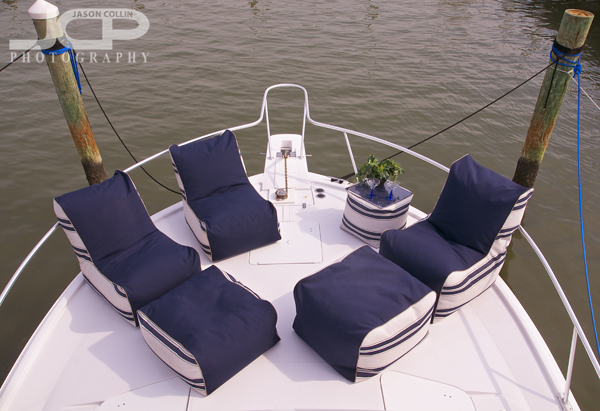 Cushease weatherproof chairs for boat & outdoor use - Commercial Photography in ClearwaterI made many of the shots from the upper deck of the boat, which required climbing up a very narrow ladder with my Nikon D300 dangling precariously from its strap. I was pretty nervous at first but by the end of the 2-hour shoot had gotten pretty good sea legs. I spent a lot of time on boats in my childhood and this commercial shoot started to make me miss the unique feeling one has when spending time on a boat. Three continuous light sources made for easy lighting setup with no undesired shadowsEach new DSLR Photography Lesson with Karin we add a little to the complexity of product shot we practice. 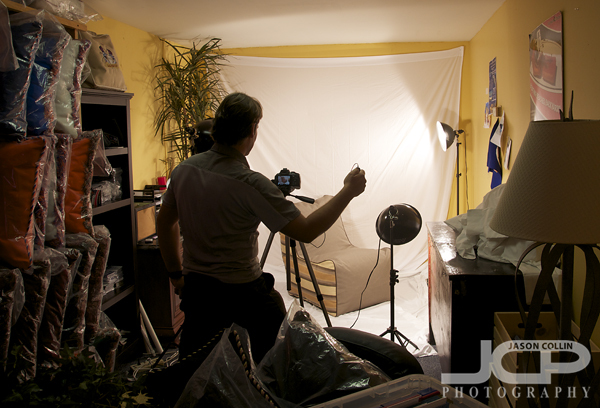 This time we needed a setup much larger than that for the pillows we previously photographed. 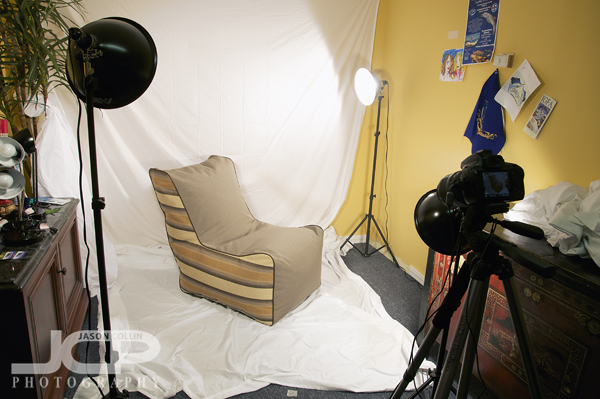 After some office space rearranging we used all three of her continuous lights for getting only the wanted shadows on a large, stuffed chair to be photographed for use in her website catalog. This was surprisingly easy as the strobist techniques for photographing people largely apply to continuous light product photography as well. Yours truly demonstrating classic remote trigger techniqueKarin now has all the photography tools to make product photography like this very simple with no mess, no fuss. Putting her new Nikon D5100 on a tripod, attaching the cable release and using Live View mode to see the image right on the back on the camera, plus using continuous lighting, means once we got all settings locked in and all lights positioned, the settings could be noted on paper and the light positions marked on the floor with tape so that consistent results can be produced shot after shot week after week. This is the benefit of shooting in studio-like conditions. For our next lesson, we may add tethering to our setup so that the images appear instantly right in Aperture 3 for preview on Karin's MacBook. Exciting! The brand new Nikon D5100 on tripod with Karin's new light setup for her pillow product shots.I returned to Northern Pinellas County this morning for my second DSLR Photography Lesson with Karin, but the first with her brand new just arrived Nikon D5100! This was of course my first time hands on with that Nikon as well and I came away impressed by its fit, finish & image quality. The D5100 was not her only new gear though, she also got a cable release for it, a tripod and a 3-light studio package! Karin wants to be able to produce great product shots for her pillows and she is not afraid to get the tools she needs to do it! I can respect that. Assembling the lights was not that difficult, but it was definitely nice to have two pairs of hands to get them together. Setting up her Nikon D5100 was no problem for me as Nikon has kept things fairly consistent across its product line for some time now. 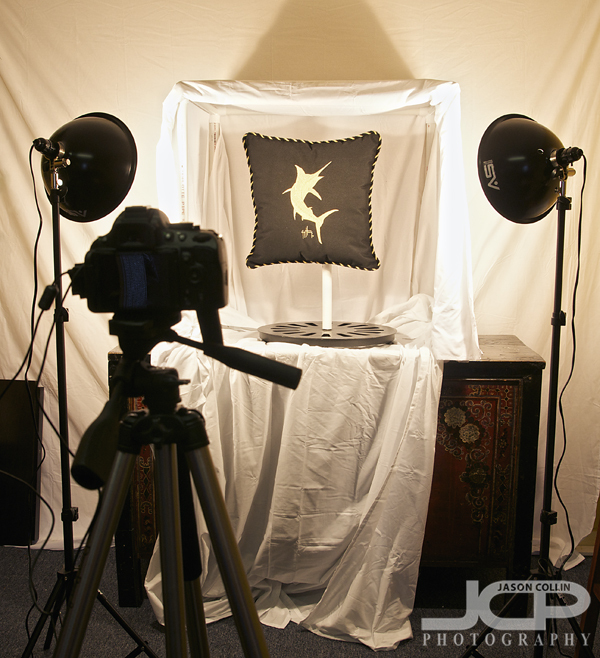 So in just a matter of minutes we had her product shot lighting studio all setup and running! Getting the correct white balance and other settings were super simple thanks to working with continuous lighting. With the D5100 on the tripod with a cable release, and all the pillows being basically the same size, and the lights being continuous, it really is no mess no fuss to produce absolutely consistent results shot after shot with minimal effort required on the photographer's part. Karin was very delighted with this. We ended the lesson with a setting the settings hands-on quiz, so I could see if Karin can reproduce the results we got earlier when I am not there. First I changed every setting on the camera so that Karin would have to go through the settings progression I recommend when in manual mode: aperture, shutter speed, ISO, white balance and then finally focus mode. She passed and is now ready to add another hat (product photographer) to the many others she already wears for her business. I am really pleased to have been able to help her with her business in some way. "I'm very excited about what I'm learning and you are a great teacher for beginners!"